Former Israeli prime minister Ariel Sharon, a hardliner revered by his countrymen as ‘Mr Security’ and reviled across the Arab world as the ‘butcher of Sabra and Shatila’, died on Saturday at the age of 85 after being comatose for eight years. "The Sheba Medical Centre at Tel Hashomer announces with sorrow the death of Mr Ariel Sharon who passed about an hour ago. Today his heart weakened and he peacefully departed from his family who were always at his side with love and support," hospital spokesman Shlomo Noy said. Sharon was elected prime minister in 2001 and served until he suffered a massive stroke that left him comatose on January 4, 2006. His condition deteriorated on New Year's Day, when he suffered serious kidney problems after surgery. He died at around 1730 IST (1200 GMT) despite efforts to stabilise him, the hospital said. "He is gone; he went when he decided to go," his son Gilad told reporters at the hospital. Sharon's vital organs had failed, including his kidneys and his lungs. His blood pressure and heartbeat, which returned to normal on Monday, deteriorated on Thursday, authorities said. They said Sharon "fought like a lion" and that "others in his condition would not have lasted as long as he did". Sharon's family gathered at the hospital to be with him in his final moments. His sons Omri and and Gilad had been by his side since his condition deteriorated. A controversial military leader, Sharon had a long and tumultuous political career and his ruthless methods had earned him the moniker ‘The Bulldozer’. He was revered by many in his country as ‘Mr Security’ for his contributions in all the major wars since Israel's independence. Sharon was reviled in equal measure in the Arab world as the ‘butcher of Sabra and Shatila’. While serving as defence minister in 1982, he masterminded Israel's invasion of Lebanon. During the invasion, Lebanese Christian militiamen allied to Israel massacred hundreds of Palestinians in two Beirut refugee camps -- Sabra and Shatila -- under Israeli control. Sharon was the first Israeli prime minister to visit India in 2003, eleven years after the two countries established diplomatic ties. A state funeral will be organised for Sharon by the Prime Minister's Office. Current and former world leaders are expected to come to Israel for the funeral, officials said. Tributes poured in for Sharon as news of his death spread. In a tribute, Prime Minister Benjamin Netanyahu said "his memory will live forever in the nation's heart". "My dear friend, Arik (Ariel) Sharon, lost his final battle today," President Shimon Peres said in a statement. Palestenians were less laudatory, with Jibril Rajub, a senior official of the Fatah party, saying, "Sharon was a criminal, responsible for the assassination of (Palestinian president Yasser) Arafat, and we would have hoped to see him appear before the International Criminal Court as a war criminal." Sharon, a combat soldier, will be remembered by Israelis for his exploits during wars. He played a key role in Israel Defence Forces’ victories in the Sinai desert in the 1967 Six Day War and in the 1973 Yom Kippur War. His victories on the battlefield, immortalised by the image of him in an IDF uniform with a white bandage wrapped around his wounded forehead, earned him the title, ‘Arik, King of Israel’. Sharon rose to the post of foreign minister in 1998. 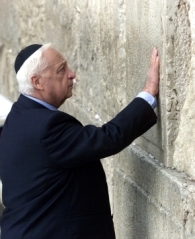 In September 2000, as the head of the Likud party, his walk on the Temple Mount was cited by Palestinians as the trigger for the second intifada (resistance). During his premiership, Israel began to build its security barrier in the West Bank. vegetative state for five years. During the disengagement, Israel evacuated 21 Gaza settlements and another four in northern Samaria. In 2005, he left the Likud party in a huff, choosing to create the Kadima party with Shimon Peres, Ehud Olmert and Tzipi Livni. After his stroke, Kadima went on to win the 2006 election under Olmert's leadership.